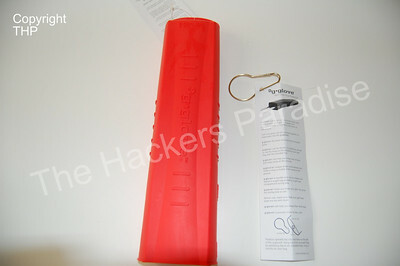 The Hackers Paradise reviews tons of products each and every month. Some good, some bad, but all of them fun. Recently many of the items that we are reviewing have one thing in common. They all fall into a similar category. No, we are not talking about drivers or putters. This category is the “Why didn’t I think of that?” section. The product today definitely falls into that area and when we first heard about it, we were eager to try it out. 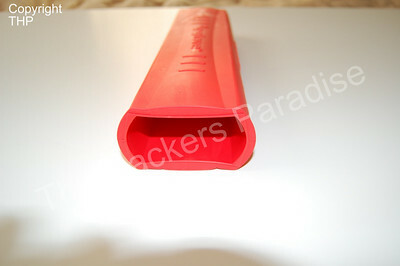 As someone that plays golf early in the morning, I have always battled with wet grips. Every time I have to lay a club down on the ground, I am always spending what seems like ten minutes trying to dry it off. Enter G-Glove! This simple product is a large piece of rubber that you put your grips into before resting them on the fairway, green, or anywhere else. When we first heard of this idea, we had to contact them immediately to review the product. After waiting only about three days the samples arrived and we were again stunned by the “Why didn’t I think of that?” saying. I want to add a couple of things here though. Although it seems as if this is just a simple device, a lot more thought and creativity went into this than meets the eye. Here is what G-Glove has to say about it. g-glove is designed to slide easily over one or two golf club grips and protect them from elements on the course. During play, you often have to carry more than one club with you as you leave the cart. As a result, you must lay the extra clubs on the ground, where wet grass, sand, dirt and mud make your grips less effective. During mist, rain or early morning dew, it’s a struggle to keep your grips dry. 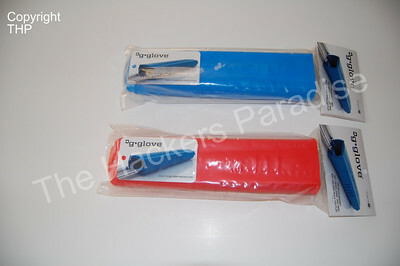 g-glove covers your grips so they stay dry and clean. After heavy rains, many courses maintain a cart path only policy, requiring golfers to walk even farther and carry multiple clubs with them. g-glove lets you carry additional clubs without the worry of where you’ll lay them down. As we mentioned before, there is more to this than just a rubber glove. They have added a towel type hook to hang it from your bag when not in use. G-glove also has finger grips for non-slip handling. Because why bother if once it is wet, you drop it and it gets water inside the thing. Speaking of getting water inside, g-glove also increased the thickness of the rubber lip at the opening to keep the shafts from touching the grass and in turn keep the unit dry inside. VERY GOOD IDEA. We took the g-glove out on the course for a few rounds and it works perfectly. Easy on and easy off. In fact, it replaced the Club Caddy in the fact that it is easier to use and quicker to load and unload. The grips stayed dry for the entire round and we had teed off both days at 7:15am where the grass is still very wet. Another small thing we noticed, is that if you are prone to leaving clubs behind, this gadget is a good idea. All of the colors that they offer are bright and catch your eye. It is rare these days to have a piece of golf gear do exactly what it says it will do. And do it well for that matter. But the g-glove does just that. Overall, we liked the product very much. The blue one is clipped on my bag as we speak and will be used from here on out. The construction of these is top notch and THP believes that if you bought one, you would never have to replace it. The MSRP on the g-glove is $23.95 and my first thought was that it seems a little high. At $14.95 it would have garnered a “Must Buy” from us. However it is well made and also made in the USA and the quality is there. If you play mostly in the early mornings, I suggest picking a g-glove up. In one round you will realize that it was worth it. For more information on the g-glove or to order one today, head on over to g-glove. Great review Josh, this would sure beat the tee method that I normally use. Why didn’t I think of that????? Yeah, I use a tee, too. Not sure I’d spend 24 bucks to change that, but as you say, if I’m out in the wet all the time, I guess maybe I would. Nice review. Im a early morning guy too. Ill have to pick one up. I dont mind spending a little extra if its made in the USA. In the morning again today, it was nice to have when I missed the green, or had my putter with me while in the bunker. I like having dry, clean grips but I also don’t like having to lay them down and pick them up. If your grips never get layed on the ground, they can’t get wet or dirty and you just “shake hands”with your club as you walk by. If I pulled that thing out, my golf buddies would laugh me off the course. I’ll stick with my tee.